Like Freud a citizen of Vienna and a practicing psychotherapist, Dr. Viktor Frankl also became a university professor and prolific author. His most widely read work is Man's Search For Meaning, a keenly observed account of his experiences in the Nazi death camps during Word War II. Originally intended for limited private circulation, the slim book has since been translated into 24 languages. In the two excerpts included here, Frankl first ponders the mystery of transcendent experience amid extreme suffering, then explores the true nature of human moral freedom. 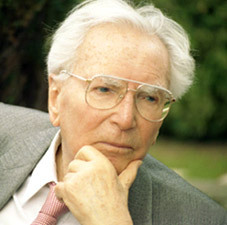 Frankl's concentration camp experiences profoundly influenced his life's work after the war, leading to his development of logotherapy, a new clinical approach to helping patients rediscover meaning in their lives. ... In spite of all the enforced physical and mental primitiveness of the life in a concentration camp, it was possible for spiritual life to deepen. Sensitive people who were used to a rich intellectual life may have suffered much pain (they were often of a delicate constitution), but the damage to their inner selves was less. They were able to retreat from their terrible surroundings to a life of inner riches and spiritual freedom. Only in this way can one explain the apparent paradox that some prisoners of a less hardy makeup often seemed to survive camp life better than did those of a robust nature. In order to make myself clear, I am forced to fall back on personal experience. Let me tell what happened on those early mornings when we had to march to our work site. There were shouted commands: "Detachment, forward march! Left-2-3-4! Left-2-3-4! Left-2-3-4! Left-2-3-4! First man about, left and left and left and left! Caps off!" These words sound in my ears even now. At the order "Caps off!" we passed the gate of the camp, and searchlights were trained upon us. Whoever did not march smartly got a kick. And worse off was the man who, because of the cold, had pulled his cap back over his ears before permission was given. "If there is meaning in life at all, then there must be meaning in suffering." I did not know whether my wife was alive, and I had no means of finding out (during all my prison life there was no outgoing or incoming mail); but at that moment it ceased to matter. There was no need for me to know; nothing could touch the strength of my love, my thoughts, and the image of my beloved. Had I known then that my wife was dead, I think that I would still have given myself, undisturbed by that knowledge, to the contemplation of her image, and that my mental conversation with her would have been just as vivid and just as satisfying. "Set me like a seal upon thy heart, love is as strong as death." ... In attempting this psychological presentation and a psychopathological explanation of the typical characteristics of a concentration camp inmate, I may give the impression that the human being is completely and unavoidably influenced by his surroundings. (In this case the surroundings being the unique structure of camp life, which forced the prisoner to conform his conduct to a certain set pattern.) But what about human liberty? Is there no spiritual freedom in regard to behavior and reaction to any given surroundings? Is that theory true which would have us believe that man is no more than a product of many conditional and environmental factors — be they of a biological, psychological or sociological nature? Is man but an accidental product of these? Most important, do the prisoners' reactions to the singular world of the concentration camp prove that man cannot escape the influences of his surroundings? Does man have no choice of action in the face of such circumstances? Seen from this point of view, the mental reactions of the inmates of a concentration camp must seem more to us than the mere expression of certain physical and sociological conditions. Even though conditions such as lack of sleep, insufficient food and various mental stresses may suggest that the inmates were bound to react in certain ways, in the final analysis it becomes clear that the sort of person the prisoner became was the result of an inner decision, and not the result of camp influences alone. Fundamentally, therefore, any man can, even under such circumstances, decide what shall become of him — mentally and spiritually. He may retain his human dignity even in a concentration camp. Dostoevski said once, "There is only one thing that I dread: not to be worthy of my sufferings." These words frequently came to my mind after I became acquainted with those martyrs whose behavior in camp, whose suffering and death, bore witness to the fact that the last inner freedom cannot be lost. It can be said that they were worthy of their sufferings; the way they bore their suffering was a genuine inner achievement. It is this spiritual freedom — which cannot be taken away — that makes life meaningful and purposeful. An active life serves the purpose of giving man the opportunity to realize values in creative work, while a passive life of enjoyment affords him the opportunity to obtain fulfillment in experiencing beauty, art, or nature. But there is also purpose in that life which is almost barren of both creation and enjoyment and which admits of but one possibility of high moral behavior: namely, in man's attitude to his existence, an existence restricted by external forces. A creative life and a life of enjoyment are banned to him. But not only creativeness and enjoyment are meaningful. If there is a meaning in life at all, then there must be a meaning in suffering. Suffering is an ineradicable part of life, even as fate and death. Without suffering and death human life cannot be complete. Do not think that these considerations are unworldly and too far removed from real life. It is true that only a few people are capable of reaching such high moral standards. Of the prisoners only a few kept their full inner liberty and obtained those values which their suffering afforded, but even one such example is sufficient proof that man's inner strength may raise him above his outward fate. Such men are not only in concentration camps. Everywhere man is confronted with fate, with the chance of achieving something through his own suffering. Take the fate of the sick — especially those who are incurable. I once read a letter written by a young invalid, in which he told a friend that he had just found out he would not live for long, that even an operation would be of no help. He wrote further that he remembered a film he had seen in which a man was portrayed who waited for death in a courageous and dignified way. The boy had thought it a great accomplishment to meet death so well. Now — he wrote — fate was offering him a similar chance. Those of us who saw the film called Resurrection — taken from a book by Tolstoy — years ago, may have had similar thoughts. Here were great destinies and great men. For us, at that time, there was no great fate; there was no chance to achieve such greatness. After the picture we went to the nearest cafe, and over a cup of coffee and a sandwich we forgot the strange metaphysical thoughts which for one moment had crossed our minds. But when we ourselves were confronted with a great destiny and faced with the decision of meeting it with equal spiritual greatness, by then we had forgotten our youthful resolutions of long ago, and we failed. From Man's Search for Meaning by Viktor E. Frankl. Copyright © 1959, 1962, 1984, 1992 by Viktor E. Frankl. Reprinted by permission of Beacon Press, Boston (www.beacon.org).